The following post is primarily for the cross country ski nerds (you know who you are), but if you enjoy beautiful mountain scenery and/or German philosophy, there’s something here for you too. Confused? Read on. 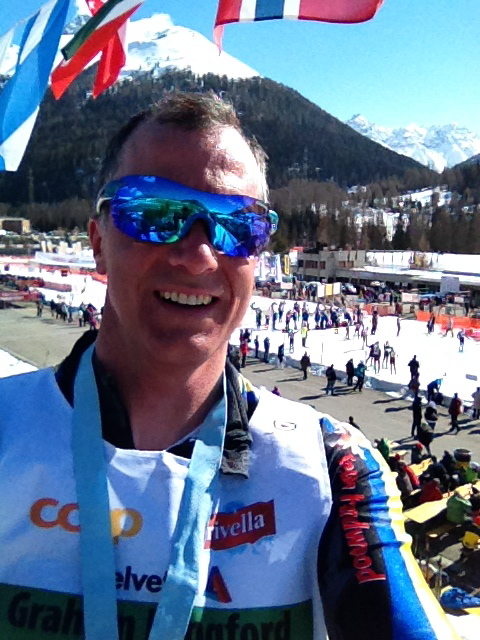 Back in early March, Graham traveled to the Engadin Valley in the far southeastern corner of Switzerland to participate in the Engadin Ski Marathon. The following is his account of that trip. The Engadin Valley, located in the canton of Graubunden, is a long, scenic and sparsely populated alpine valley that is a popular destination for outdoor sports enthusiasts. The ski marathon, now in its 45th year, is a 42km free technique race on a mostly flat course that starts in the village of Maloja at the far end of Lake Sils and ends in the village of S-chanf. The incredibly scenic race course winds through the valley, passing over frozen lakes and meadows and through (literally!) 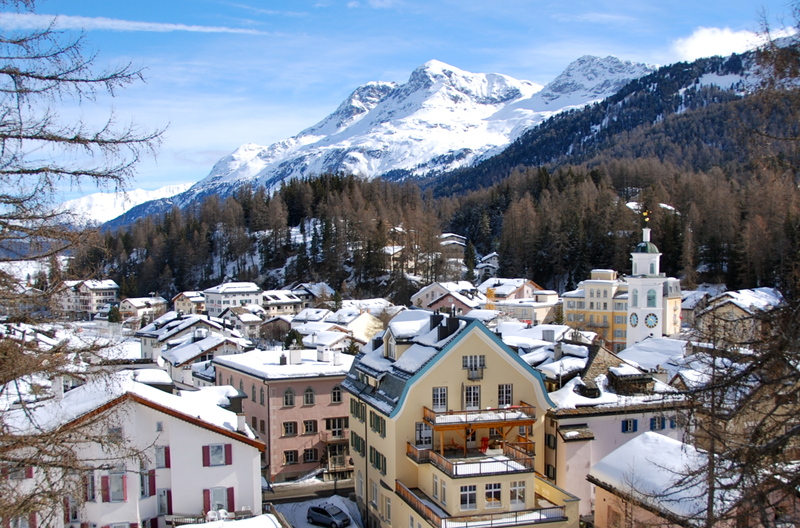 a number of villages, including the famous resort town of St Moritz. The marathon is one of the races that make up the international WorldLoppet circuit (which also includes Sweden’s famous Vasaloppet and Canada’s own Gatineau Loppet), and typically attracts about 12,000 participants each year. The iconic image of thousands of skiers snaking their way across Lake Sils caught my imagination years ago, so when we moved to Switzerland I was eager to put myself into that picture. 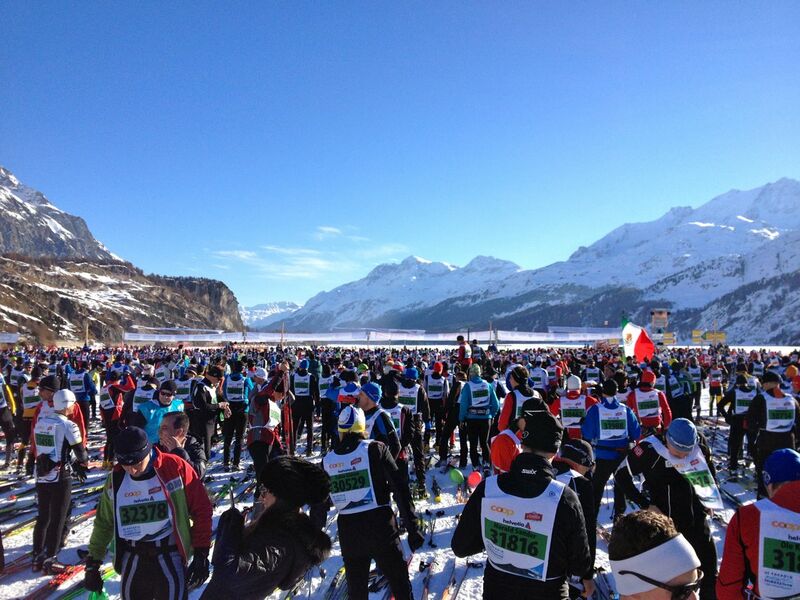 The Engadin Ski Marathon snaking its way across Lake Sils. I opted to drive to the Engadin valley 2 days prior to the race in order to try to acclimatize and to preview the race course. With the race starting at 1800m elevation (5900ft) I was concerned about the effects of altitude on my race, since I had spent the season training at lower elevations, with only occasional trips to higher altitude in France. I think I made the right decision. On the day I drove to the Engadin valley I arrived in the small town of Silvaplana, where the road drops down into the valley from the 7493ft Julier Pass. One of the first things I spied was a nordic ski shop, so I decided to drop in and pick up some last minute waxing supplies and hopefully some local beta. I struck up a conversation with the owner about snow conditions, weather forecasts, and waxing suggestions. By the time we got down to discussing the merits of different skis flexes and rill patterns I came to the conclusion that he knew what he was doing and decided to leave two pairs of skis with him to race wax for me. We call this “credit card” waxing, and while some people shun the practice I was relieved to spare myself the additional stress of testing and preparing race wax. I just wanted to stay relaxed and focus on my pre-race routine on the morning of the marathon. Plus I had spent the last 4 winters race waxing hundreds of skis for Team Hardwood athletes and decided to just indulge myself! Sils Maria, a tiny perfect Swiss village with surprising cultural importance. From here I carried on to my hotel, the Waldhaus Sils-Maria, situated on a hill overlooking the small Engadin village of Sils-Maria. I knew nothing about this picturesque village, except that it was just 5kms from the race start and the race trail went right past it, so I thought it would make a good training base, and I planned to warm up on race-day by skiing straight from the hotel to the start line. Little did I know about the surprising cultural heritage of the town, but more on that later. After settling into the hotel I put on my training skis and went for a short ski to look around the valley and check out the trails. Within minutes of beginning to ski, however, a heavy fog rolled into the valley and I spent the next hour skiing in pea soup conditions. While I didn’t get to see much of the valley, I got a good sense of how the altitude would affect me … it wasn’t a great feeling. While I tried to ski at a very easy pace, my heart rate kept creeping up much higher than it normally would at such a pace, which was a concern. I was thankful that I still had another full day to acclimatize. The view from my hotel window, with a thick fog descending to the valley floor. After breakfast the following day I went out for a short hike on one of the many trails that thread along the valley floor and up into the surrounding mountains. The trails are snow-covered but well-maintained even in winter. I hiked a few kilometres and found a couple of lookout spots that gave beautiful panoramic views of the valley and frozen lakes below, including a view all the way down to the end of Lake Sils to the start line in the village of Maloja. 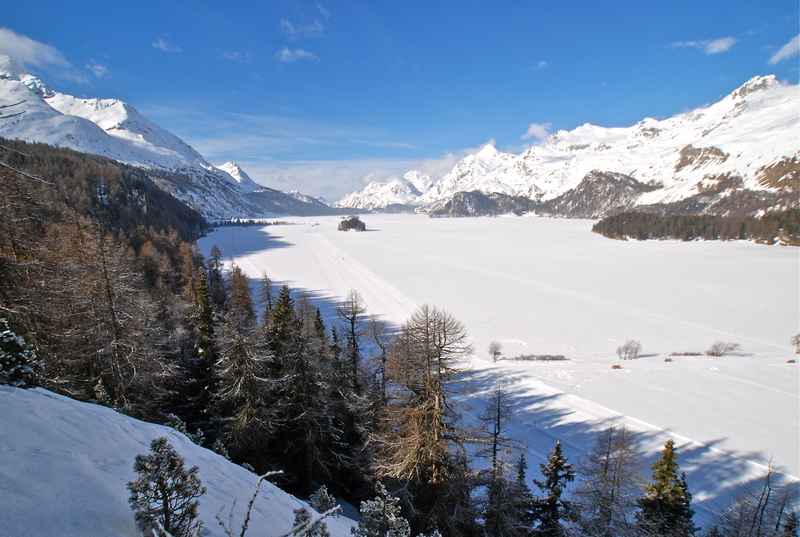 Lake Sils and the Engadin Valley, seen from one of the area’s many winter hiking trails. In late morning I went for a longer ski, with a plan to recon a section of trail just past St. Moritz that had a number of short climbs and technical downhills. From my hotel to St. Moritz the trail crosses the frozen Lake Sils and Lake Silvaplana and is flat as a pancake, with the exception of one short but very narrow and steep climb (perfect for bottlenecks!). After St. Moritz there is a 5km section of rolling climbs and descents which concludes with a long, fast and technical downhill that descends through a wooded slope to the village of Pontresina at the halfway mark of the race. On the downhill the trail splits into several narrow braids that wind through the trees, including a couple of dozen wrapped with thick padding! Clearly this was going to be an exciting downhill on the morning of the race. On my way back to the hotel I skied a few race paced intervals and found myself gasping from the effort at this altitude, leaving me wondering about how the race would feel the following morning. After picking up my race skis late in the afternoon I walked down into the village of Sils-Maria, where I made a surprising and delightful discovery. As I walked down the charming main street, something unexpected caught my eye: a small sign by the road with a picture of Friedrich Nietzsche, the famous 19th century German philosopher. It was then that I noticed a 2-story cottage set back from the road with a large plaque at the front that read (in German): “In this house lived Friedrich Nietzsche”. Curious, I walked up to the house and found that not only had Nietzsche spent most summers from 1881-88 living and writing in this cottage, but that it now houses a small museum and research institute dedicated to his work; better yet, it was open! 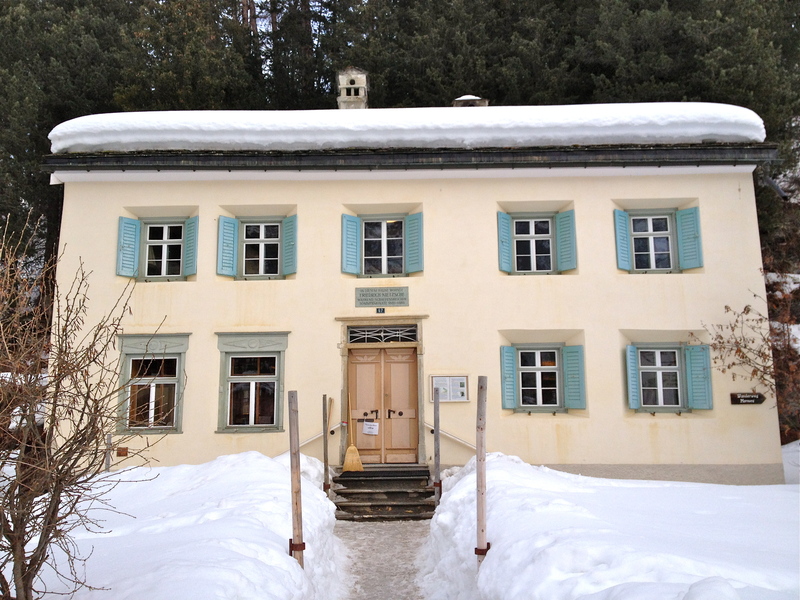 The Nietzsche House in Sils-Maria. Now, granted, historical sites dedicated to philosophers don’t arouse much curiosity with the general public, so let me explain why I was drawn to this one. Back in the day, I took a lot of philosophy courses as an undergraduate and graduate student, and eventually earned a PhD in political philosophy from York University. Nietzsche was one of the most famous philosophers of the 19th century, and his work remains influential (and controversial) to this day. He was a major influence on the French philosopher Michel Foucault, whose work was the subject of my own doctoral dissertation. Now, while all of this philosophy business is behind me, I couldn’t resist going to have a look. The Nietzsche Haus is fairly modest and a little shabby, but it contains a very interesting collection of old photographs of Nietzsche, original letters, book manuscripts, and other Nietzsche memorabilia (including a “Will to Power” energy bar that I was very tempted to steal and eat before my race!). 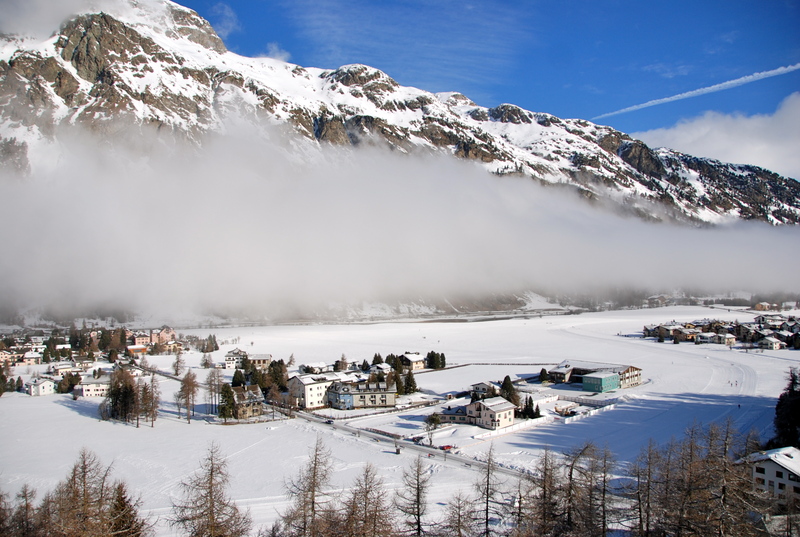 The house, the village of Sils-Maria, and the surrounding Engadin countryside were of special importance to Nietzsche. After resigning from his post as a professor at the University of Basel in 1879, due to poor physical and mental health, Nietzsche began a nomadic existence, seeking more benign climates in Italy and southern France. Beginning in 1881, however, Nietzsche spent a series of summers in this house in Sils-Maria, where he was inspired and healed by the rugged beauty of the Engadin valley. Nietzsche spent every summer here until 1888, wrote many of his most famous works here (the museum houses many original annotated drafts and manuscripts), and it is where he felt most at home for the remainder of his life. Nietzsche’s “Will to Power” energy bar, nutritional supplement of the “superman”! Nietzsche often wrote to friends and colleagues about the beauty of the Engadin valley and over the many decades since it has served as magnet and inspiration for a host of the 20th century’s greatest writers and thinkers. Among those who have spent time in the Engadin are Thomas Mann, Marcel Proust, Herman Hesse, Boris Pasternak, Pablo Neruda, Theodor Adorno, Jean Cocteau, and Switzerland’s own Friedrich Durrenmatt. Situated amongst the collection of photos of the cultural luminaries that have frequented Sils-Maria was another surprise – a photo of a very young Anne Frank! As it happens, Anne Frank spent a number of summer vacations here with relatives in the mid-1930s. 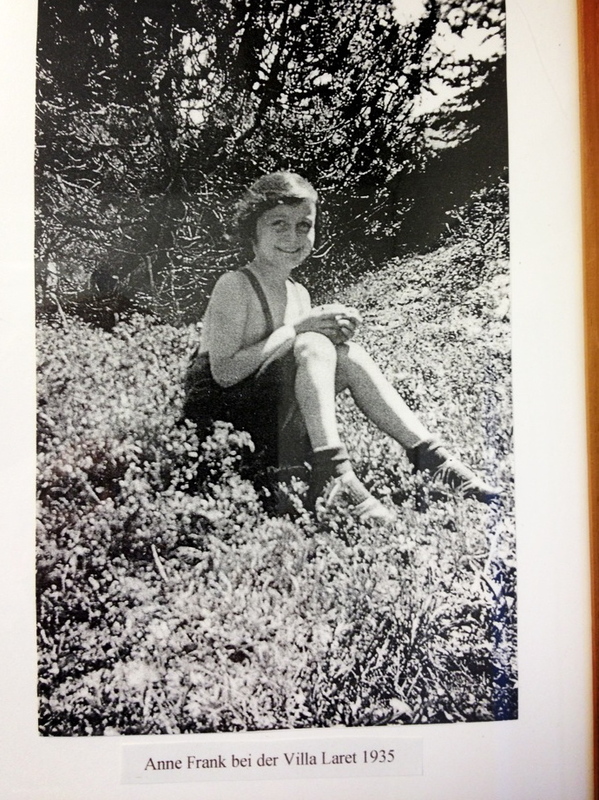 Anne Frank, another of Sils-Maria’s famous visitors. I spent a good hour perusing the museum’s collection before the doors were closed, and decided to take inspiration from Nietzsche’s famous phrase “What doesn’t kill me makes me stronger,” given my concerns about the effects of altitude on my race the following day. The morning of the race was clear and sunny, with a temperature of -4C, which promised a fast and icy race course. I had a quick 5km warm-up skiing from the hotel to the start line, where I was confronted by the chaos of 12,000 other skiers all trying to stake out a spot in the start pens, drop-off warm-up clothes to be transported to the finish, use the portapotty, etc. etc. The first thing I did was take my skis to my start pen, where I found a few hundred pairs of skis already lined up ahead of mine, so I had to settle for a spot on the 4th row! While I gave myself 45 minutes to get all the other pre-race jobs done, I barely made it back to my skis in time for the start! A sea of skiers getting ready for the start. I started in the 4th wave (Hauptklasse A) with over 2,000 other skiers, so it was total chaos as soon as the gun went off, as everyone jockeyed for position on a track that was about 50m wide. The track was hard and icy, which makes skating technique more difficult and inevitably people started to go down. Passing slower skiers in front of you wasn’t really an option either. After dodging the 3rd or 4th wipe-out I started looking for the 4 lanes of classic tracks that had been groomed just to the right of the main skating trail and which were completely empty. I succeeded in making it safely to the classic tracks and started double-poling at a strong and steady pace, and found that I was slowly making my way closer to the front of the pack without risking a crash. After a kilometer or so of this my upper body felt strong and I decided to continue double-poling across the lake until I cleared more of the field and found a safe place to re-enter the skating lanes. I ended up double-poling most of the first 12km of the race because the trail was dead flat and the icy tracks were very fast (I blew through 10km in 25:00). I also figured I would save my legs for the hillier section after St. Moritz. Once past St. Moritz the course kicks up into a series of rolling hills with short climbs and fast, twisting downhills. I felt good through this section and was frustrated by my inability to go faster due to a lot of congestion on the uphills, where we literally came to a complete standstill a few times! I also noticed that I wasn’t feeling any of the effects of altitude that I had experienced in the previous days, which was a big relief. This is me mid-way through the race, rockin’ the Team Hardwood race suit! I made it safely through the tricky and very congested descent into Pontresina, although I saw a lot of other bodies go down. After Pontresina the marathon course begins a gradual 20 km descent along the valley floor, with long stretches perfect for wide-open 2-skate and free-skate technique. I found a few fast skiers to draft behind and together we reeled in dozens of slower skiers from previous waves. Having the energy to go all out in the final few kilometres felt amazing (except for a few twinges of cramp in my lats and triceps thanks to all the double-poling earlier in the race). I took an inside line going around the final corner before the finishing straight and ended up jostling elbows with a skier next to me, who ended up falling – ooops! “Entschuldigung!” I called over my shoulder as I sprinted for the line (that’s German for “Sorry!”). All smiles in S-chanf, after receiving my finishers medal. My final time was 2:04:08 for 42km, with an average speed of 20.4 kph, which I was quite pleased with. I had trained hard and consistently for this race, (logging over 1000kms on snow in a 3 month period), and felt like my training had paid off. The winning time for the race, which featured members of the Swiss, Italian, Finnish and French national teams, was 1:28:00. I came in 147th of the 2139 people in my Hauptklasse A wave. Looking at my overall placing, however, was considerably more humbling – 1859th out of 8013 participants in the full marathon! Clearly there are a lot of uber-fit people in this country! I’m already thinking about next year’s race(s), including the Transjurasienne (France, 76km) and the Marcialonga (Italy, 70km). Anyone want to join me? You are such a good writer Graham. Wishing I was there and can’t wait to see the Nietzsche. I did not realize that he had connections to Anne Frank. Congratulations on a good ski!